The Saitek Mephisto Series Expert Travel Chess Computer is perhaps the most powerful compact Chess Computer available anywhere. Its sheer power and play capacity (with an estimated play rating of 2000+) combined with a huge collection of powerful features, makes this Chess Computer the number one choice for the expert Chess player. Its programming is endorsed by all time world Chess Champion Garry Kasparov and bears his name on the surface. Prepare for a playing challenge you will not forget! Some of its key features include 64 Playing Levels: Normal, Infinite, Tournament, Blitz, Fun, Mate Search, Adaptive, and Training. Coach Mode provides capture alert and tactical alert warnings. Game play options include user-selectable Search Algorithms for customization, 50 move Take Back, and a setup option that lets you try out new positions & moves. It supports all major openings and many famous grandmaster moves. Its Info Mode provides extra insight to the computer’s moves, and it offers the ability to save unfinished games in memory. 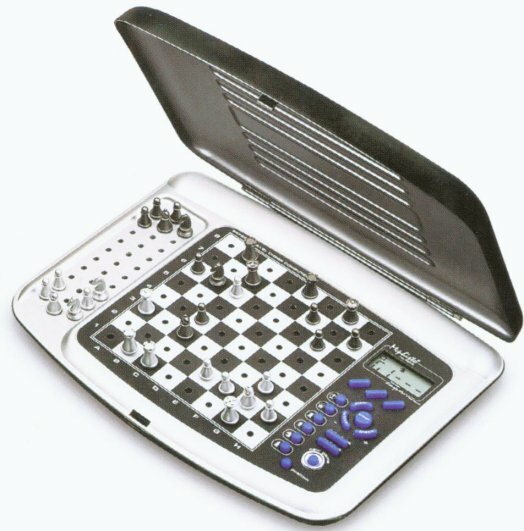 The game comes in a compact laptop style case with a flip down lid, a chess piece storage area for safe keeping, Integrated LCD screen, built in Chess Clock and an automatic power down feature that conserves battery life. Uses 4 AA batteries (not included).